The Hawaiian Islands have provided us with a number of impressive examples of species radiations. Some of these, such as the Hawaiian honeycreepers, are well known to the general public. Others, such as the subject of today's post, may not be so famous but are no less noteworthy nonetheless. Individual of a Laupala species, copyright K. Shaw. 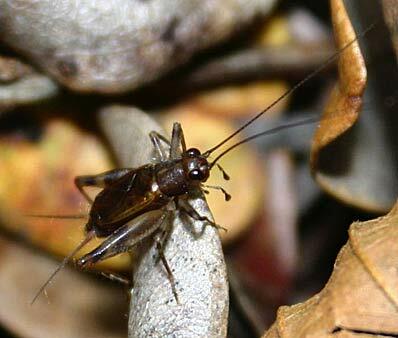 Laupala is a genus of crickets distributed between all of the main islands of the Hawaiian chain. For a long time, they were all believed to belong to a single species referred to as Paratrigonidium pacificum. However, in the late 1960s, two entomologists, Richard Alexander and David Otte, started taking recordings of the songs of Hawaiian crickets. They began to realise that individuals of 'Paratrigonidium pacificum' from different localities had noticeably distinct songs. Most of these songs consisted of a fairly basic series of regular pulses of sound, but the frequency of the pulses could vary from only one every three seconds to four every second. Some of the song types were extremely localised; Otte (1994) referred to an occasion when he lost his car keys while out collecting at night, and was able to relocate the area he had been in and find his keys by following which crickets were singing. There might be one song pattern to be heard on the windward side of a ridge and an entirely different pattern on the leeward side (admittedly, in the precipitous landscape of many parts of the Hawaiian Islands, a 'ridge' an amount to a pretty serious geological barrier) Eventually, Otte (1994) would recognise the earlier 'Paratrigonidium pacificum' as including over thirty species of Laupala, plus a couple of species distinctive enough to be placed in a related genus, Prolaupala. Some of these species can be distinguished by their external appearance, albeit by relatively minor variations in coloration and patterning that would not be easily picked up, or by features of the male genitalia. Many cannot and can only be distinguished by the songs of the males. All indications are that the Laupala have undergone rapid evolution to reach their current diversity. The oldest of the islands that Laupala species have been found on to date, Kauai, is about five millions years old. The big island of Hawai'i is less than a million years in age. Nor, of course, is there any reason to assume that the crickets have stopped diversifying. Laupala cerasina, a species found over a large part of the island of Hawai'i, is highly variable in both song pattern and morphological features; indeed, variation between populations of L. cerasina is such that they could easily be regarded as separate species were it not for the failure (to date) to identify clear separation between the variants. A comparison between phylogeny of the genus and island age suggests that Laupala species have been diverging at a rate of up to more than four speciation events per million years (Mendelson & Shaw 2005). This is one of the fastest recorded rates of speciation in the animal kingdom; only African cichlids have been calculated to be diversifying faster. It is perhaps not surprising that both of these cases of rapid speciation appear to be driven by features related to sexual selection; it has been suggested that the power of sexual selection is such that what amount to questions of taste can cause wholesale change in populations within a matter of generations. Patterns of variation observed within different species of Laupala are also consistent with the predictions of sexual selection: on the island of Oahu, the species L. pacifica has a song that is noticeably faster in localities where it co-exists with the slower-singing L. spissa than in localities where it is the only species. 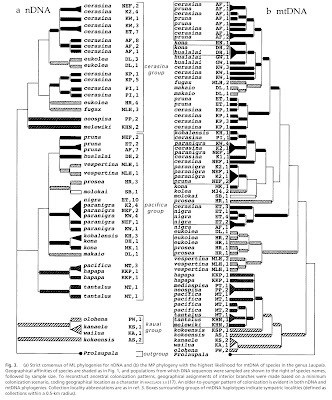 Results of phylogenetic analyses from Shaw (2002), showing disagreements between nuclear and mitochondrial genetic analyses. The Laupala radiation also resembles that of the cichlids in that it gets more complicated the closer one looks. In his original description of the radiation, Otte (1994) recognised three species groups, separated on the basis of morphological features. One of these, the L. kauaiensis group, contains those species found on the island on Kauai. As befits Kauai's position as the oldest and most isolated of the islands involved, phylogenetic studies agree that this species group is well separated from the other two. The other two, more diverse, groups, the L. cerasina and L. pacifica groups, are each dispersed over the islands of Oahu, Maui and Hawai'i (the L. cerasina group also includes two species on the island of Molokai). Analyses of nuclear genetic data support these species groups, implying multiple dispersals between islands. The phylogeny presented by Mendelson & Shaw (2005) on the basis of AFLP (amplified fragment length polymorphism) data is consistent with divergence of the two groups on Oahu followed by sequential dispersal of each of the two groups down the line of newly emerging islands; an earlier phylogeny presented by Shaw (2002) on the basis of nuclear sequence analysis is perhaps a bit less tidy but still fits the same overall framework. However, an analysis of mitochondrial genetic data that was also presented by Shaw (2002) presents a quite different picture. With the exception of the Kauai group, Otte's species groups were not supported by the mitochondrial data. Instead, two species from a single island that might be placed in separate groups by the morphological and nuclear data would be placed close together by the mitochondrial data. How can this discrepancy between the data sources be explained? The most likely explanation is that the nuclear and mitochondrial data reflect different genetic histories. Because mitochondria are inherited only in the maternal line, interbreeding between individuals of different species can result in progeny containing nuclear and mitochondrial genes with entirely distinct heritages. The implication is that the boundaries between Laupala species have not been impervious, that there has been a certain degree of hybridisation in the past. Again, there are reasons for finding this credible. Studies of mating behaviour in Laupala have found that, as a species isolating device, song patterns are only effective at a long range. Females will only actively seek out males producing the right song patterns, but they will not refuse males singing differently whom they happen to encounter on the way. Song patterns are not the only reasons a female may have for refusal; for instance, Mullen et al. (2007) identified a distinct separation between species by cuticular chemistry, implying that individuals of different species smell or taste as well as smell different. Nevertheless, species of this genus diverged recently enough that it is quite credible that they could remain interfertile when the occasion arose. Mendelson, T. C., & K. L. Shaw. 2005. Rapid speciation in an arthropod. Nature 433: 375–376. Mullen, S. P., T. C. Mendelson, C. Schal & K. L. Shaw. 2007. Rapid evolution of cuticular hydrocarbons in a species radiation of acoustically diverse Hawaiian crickets (Gryllidae: Trigonidiinae: Laupala). Evolution 61 (1): 223–231. Otte, D. 1994. 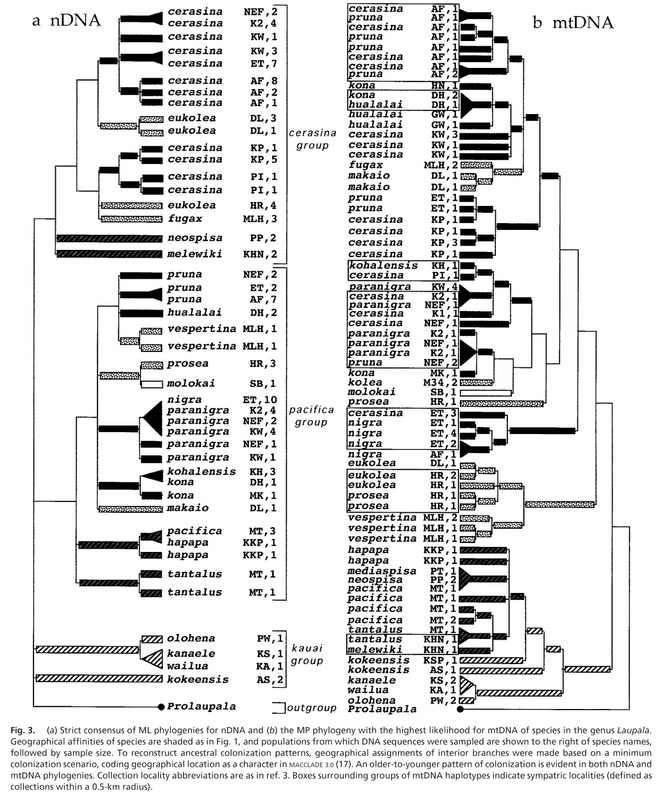 The Crickets of Hawaii: Origin, Systematics and Evolution. Orthopterists' Society, Academy of Natural Sciences of Philadelphia. Shaw, K. L. 2002. Conflict between nuclear and mitochondrial DNA phylogenies of a recent species radiation: what mtDNA reveals and conceals about modes of speciation in Hawaiian crickets. Proceedings of the National Academy of Sciences of the USA 99 (25): 16122–16127.